Great project! I'm following this. Looks good! Oh boy, a Cartwright engineer... Good, people can ask you if your floor can support tanks now! Is there a reason you didn't have your drain manifold run at the same height as the top of your sump instead of dropping below it and then going back up and over the top of the sump? I'm just curious about it and wondering if you have any issues with it self starting after a power outage? Keep the updates coming. Looking great! Krazie - I took it down lower so that it would not show through the glass on the back of the tank. I am still not sure what I will do for a background. I didn't want to put the sump a lot lower though. I built the sump stand to allow for an additional 40g breeder to fit below. As far as self starting issues, I guess that I am not sure what you are talking about. When the power goes out the overflow box drains and water will just sit in in the drain until the return starts back up. There is no siphoning and it starts up just fine. My main concern is sediment buildup in the line. I will see how it goes. One nice thing is that I do get a lot of flow from the return. 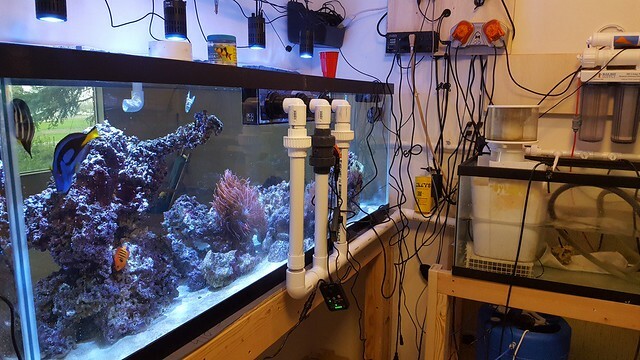 The total head height is only like 1.5ft-2ft so the flow rate substantially more than when the sump was under the tank. 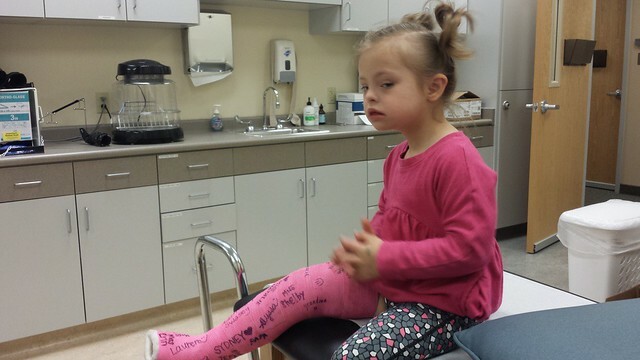 She broke her leg crawling out of the crib both bones. ouch! Let me use your picture to try and explain what I meant. So in order for the bean animal to work correctly (and silently) it has to be able to run a restricted airless siphon on the herbie, upto a full flow on the Durso and not draw air into the line from the emergency. When the return shuts off the siphon breaks on both of the siphon drains and fills the pipe with air down to the level of the water in the sump and then holds water in the pipe drain pipe at that level. See my edit of your picture below. (Red is water level with the return off, yellow is air in the pipe and blue is water left in the pipe). So then when the the return starts back up the drain has the potential to become whats called air locked due to the air in the lines being trapped between the water in the pipe and the water entering the drains. That air does not want to got down the pipe so this standing water in the pipe creates resistance to the siphons starting by them self until the drain either burps the air back up the drains or is able to break the air up into smaller bits and force it down the pipe and out the sump end. Most drain pipes in this drain setup will completely drain of water during the shutdown to prevent this airlock condition from happening. It sounds like somehow you have not experienced an airlock yet but I just saw that there was the potential for it to happen in this setup. A second question I have after thinking this through is in your setup where all three drains go into a single manifold do you experience any noise from air being sucked from your emergency drain into the manifold and then creating bubbles or gurgling at the sump? Because this drain setup is supposed to work based off of siphon it would seam that your emergency drain is a "hole in the side of the straw" and would be introducing air into what is supposed to be a "sealed" siphon. Krazie, I think that I am understanding the bean animal differently. 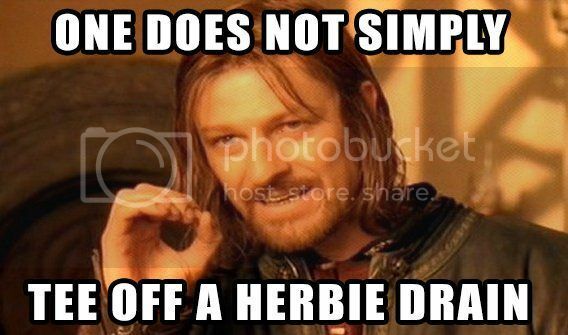 The way I understand it is that the herbie is the full siphon that is restricted to just less than the amount of water that you want flow down the overflow. The Durso takes the remaining (small) amount of water that remains as well as variations in flow. To my understanding the durso never takes a full siphon because it has a hole in the top to prevent this. As far as the emergency overflow being like a hole in a straw I am not sure this will happen because the water level will always separate the different overflows because the water level never goes below the output drain into the sump. If I am still not understanding this right please point me to an article that you feel can explain it some more. Thanks. The more that I think about it though I am pretty sure that I want to run the emergency drain as a separate line. I might be redoing the drains. So to tell you all a little more about the move. I was able to get everything in one load. 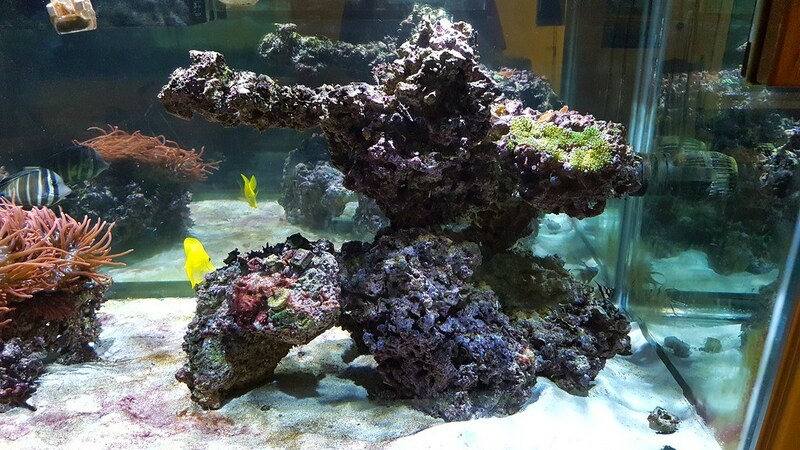 I only had a few corals and the anemones to worry about so that made moving the rock easy. The fish were easily caught and we headed to the new house. When we got to the house i put all of the fish in the 2 quarantine tanks. 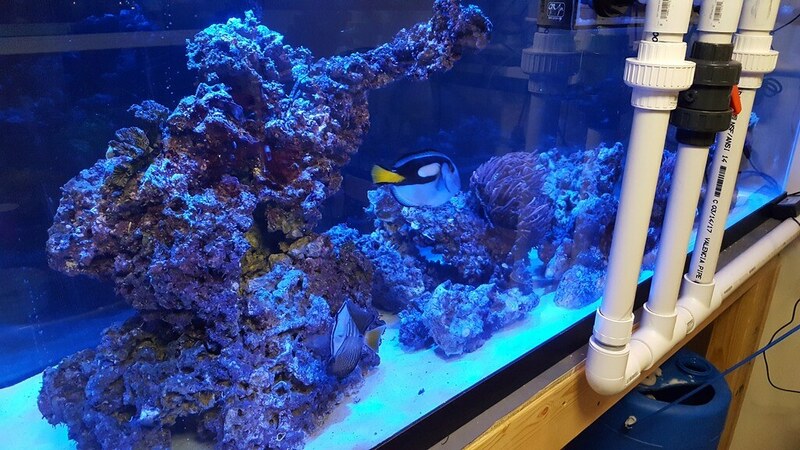 The clownfish and the smaller fish went in the upper and all of the others went in the lower. 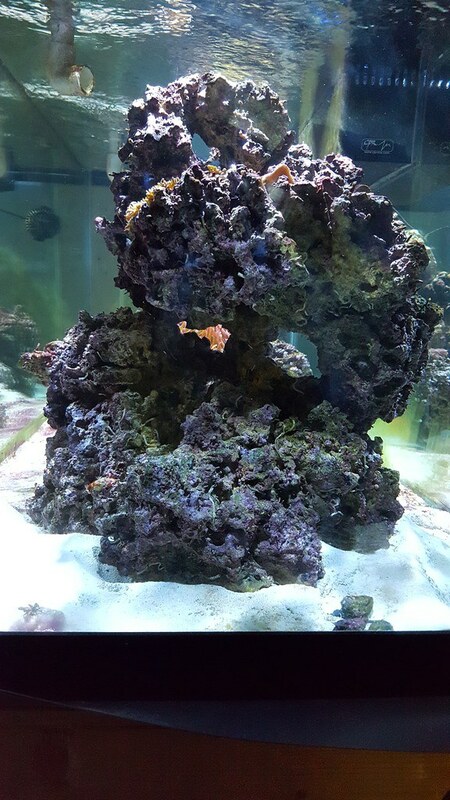 I quickly got the rock into the tank. I connected the apex, set up the protein skimmer and got the return pump going. Everything went fine until we had to go. After everything was said and done the aquarium was the last thing I was worried about. The tank was running, the fish were in the quarantine tanks everything would be ok until I came back the first thing in the morning. I was wrong I think that there was not enough oxygen in the water. When I showed up the next day the Lamark was long gone and the yellow tang was gasping on his side. I quickly threw all of the large fish into the main display except for the yellow tang. I did't want him dying under the rocks so I threw him in the sump. The hippo and sailfin we almost imediatly better and the yellow tang was getting better until he got too close to the return pump ( I think). 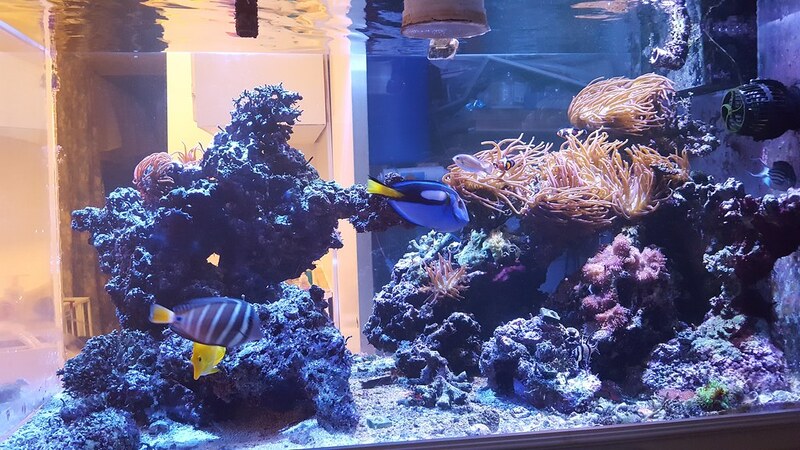 I got the yellow tang back into the tank with the clowns and did an 80% water change. I think that the main culprit of the Lamarks death was the fact that circulation pump in the lower quarantine tank was not working right (that's why I think the oxygen was too low). Everything is fine now but it was hardly the best tank move I have ever done. 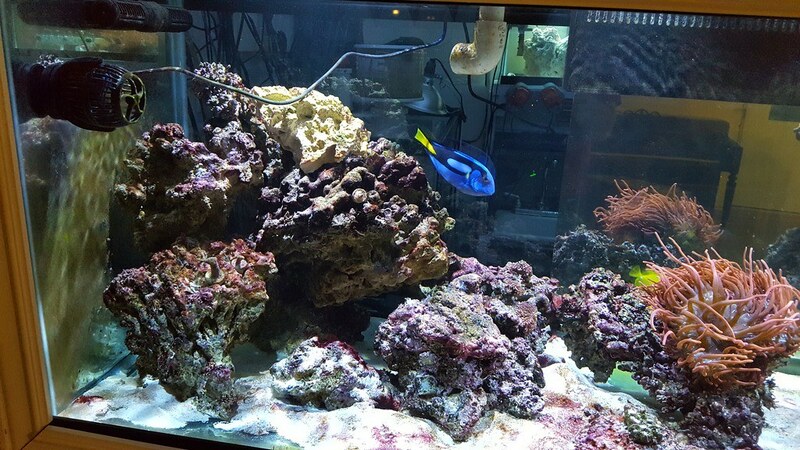 Here is the tank right now. I will work on aquascaping more once things settle down a little more. Here is the back of the tank. Chords are a mess but I will work on that later. 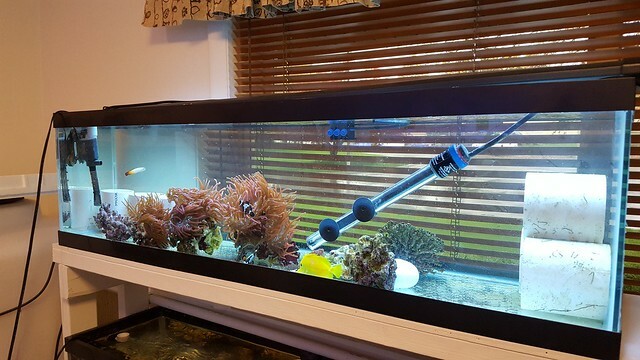 Here is the quarantine tank. I am planning on trying my hand at raising clownfish. That is why they are in there. I had siphon on the brain while typing. I updated my post with the correct words to avoid confusion from readers. We are of the same understanding on the drain setup. Any chance you could do a youtube video looking down into the overflow box while the return pump comes back on? One of the drain outlet pipe in the sump while it's running would help as well. The reason that I believe your emergency drain may be allowing air into the drain is because while running the water level in the sump is just above the horizontal run of drain pipe. 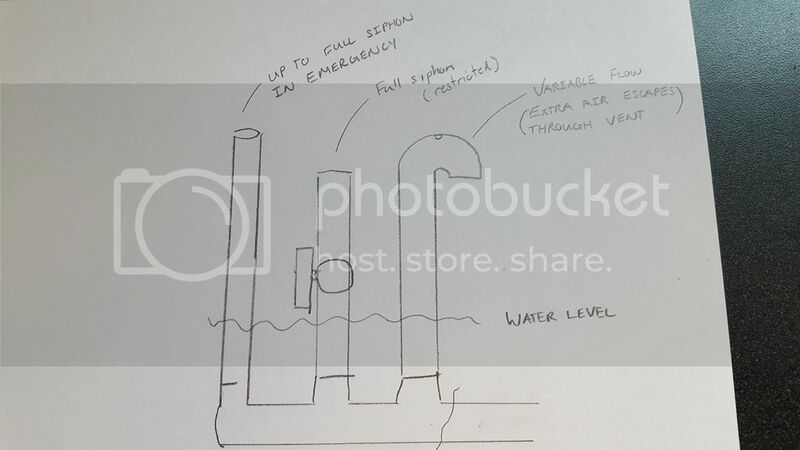 This means that the larger manifold pipe will attempt to be a siphon but because the durso and emergency drains allow air in the siphon in the manifold is broken at that point and just becomes gravity fed. You might be right about what is making this entire scenario work and that is the running level in the sump being slightly above the horizontal portion of the drain. The only actual siphon portion in your design is from the Herbie input at the overflow box to the T where that line hits the manifold. Anything past there is gravity flow unless all three drains are covered in water completely and siphoning as well. This last condition is what I believe is happening during the return startup which creates a full siphon on all three drains (maybe a slight air leak on the durso vent) but once that siphon starts it almost immediately drains the overflow, manifold, the durso and emergency drains and then draws air into the manifold and breaks the siphon for everything but the Herbie. Does that sound like what you see during start up? I'm just going through scenarios here as I have bad experiences with drains not working correctly so i probably over think them now. If you want to move on just say the word. I'm just trying to verify my understanding, get enough info to understand why this setup works and where it may fail based on the original design concepts of the drain style being used, and hopefully learn a bit more in the process. I will make a video in the next few days Krazie. I knew that having the sump at a similar level to the tank was not typical when I started this build. I will show a couple of scenarios as well (pump start and stop, plugged overflow. 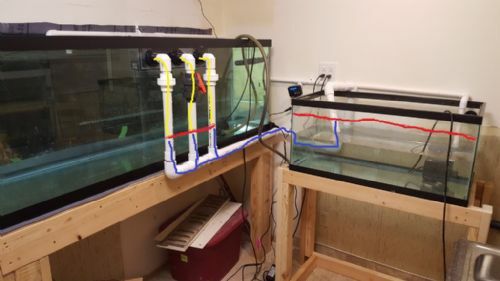 I also got the auto water change system set up and I think that I will do a little video of that as well. That would be awesome. I'm working on one of those for my system as well. It would be great to see what you ended up doing. It has been a little while but here is a quick update. I was able to get some aquascaping done. 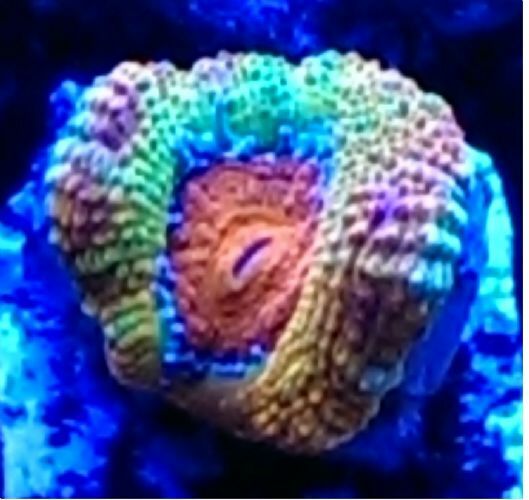 The style is similar to my last tank. I has one main island on one side of the tank and an open cave network on the other. 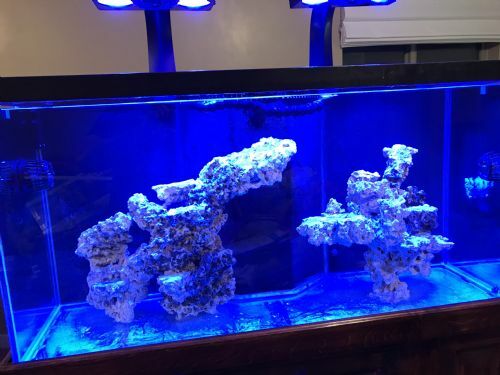 I think that I want to get some more rock but we will see. Here is my favorite view. 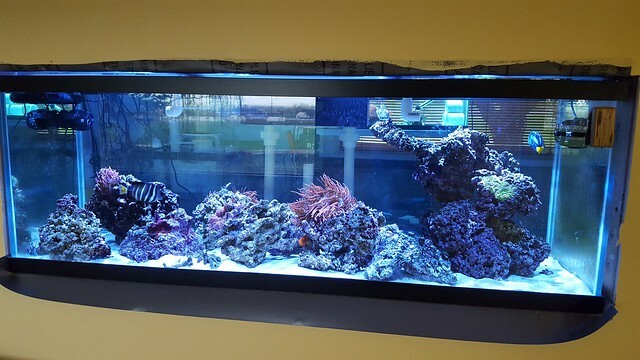 It is the side of the tank just as you walk in the fish room. Everything is a process right now. 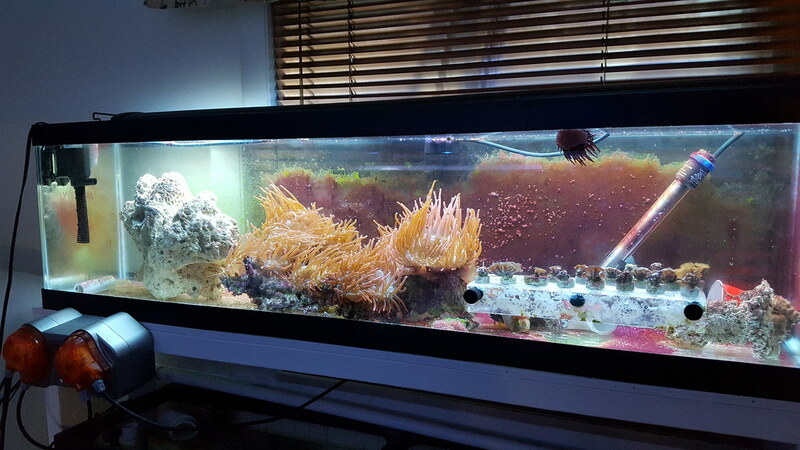 The tank has looked better and I am struggling a little with the cyano. I am changing out 6 gallons a day to make sure that the water is as good as possible and to help some new fish in the quarantine. I like the rockwork. Lots of places for the fish to swim around in between all the rocks. Very nice! Its looking good! 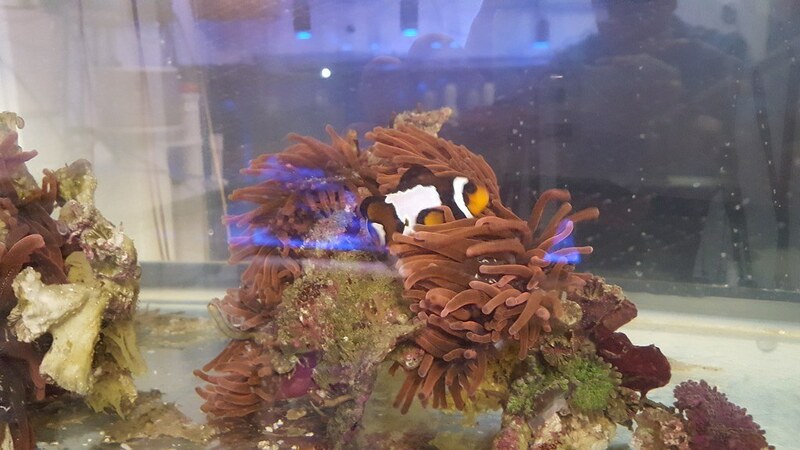 Those anemones are huge! 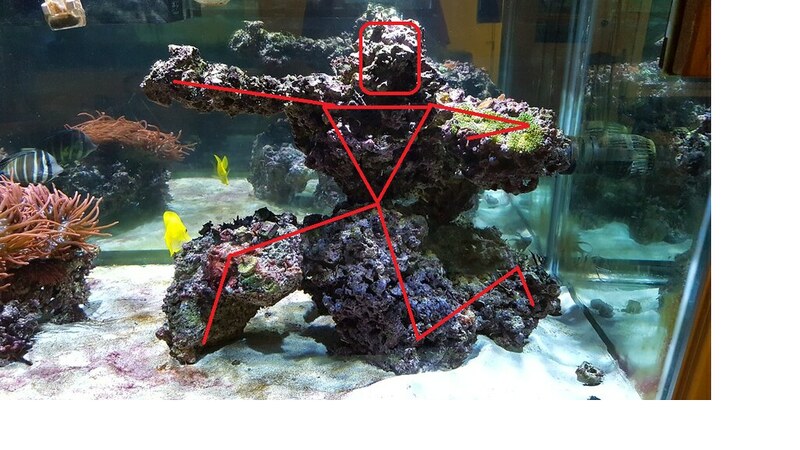 The other day I just noticed that my main island on the right side of my tank looks like a man striking a pose. I thought it was pretty cool when I realized it. P.S. Sorry about loosing all of my pictures. Looks like Photobucket gave all the free users the middle finger.